The Mediterranean region offers a great diversity of population, languages and cultures and it is the intersecting point of three different continents – Europe, Asia and Africa. The SGC has a security role for the European energy supply. TAP connects six countries (and the others nearby), improving the community quality of life, enhancing the environmental management, and enabling improving skills and abilities through the support for education and training initiatives. In 2016, the Mediterranean natural gas production accounted for 166 bcm. As expected, the MENA countries (Middle East and African) were the main producers and exporters, producing 158 bcm and exporting 60 bcm in 2016. The EU 28 countries were the main importers (roughly 153 bcm), producing only 7 bcm, while the Balkans imported 46 bcm. In 2016, the average per capita of gas consumption in the Mediterranean region was 626 mc/capita. As for the final gas consumption, industry accounted for 34% in the EU-Med and MENA countries, while 41% in the Balkans and Turkey. Other sectors (which include residential, services, agriculture/forestry, fishing and other non-specified sectors) accounted for 61% in the EU-Med, 56% in the Balkans and Turkey and only 35% in the MENA Region. In MENA countries, 27% of gas consumption was absorbed by non-energy uses – the highest share in the Region. Natural gas is expected to play an increasingly key role in the European energy mix for the decades to come. As the cleanest fossil fuel, it has clear environmental advantages and it also provides an important and flexible energy option in conjunction with renewable energy. For more than a decade, one of the most key questions of the European energy security has been the realization of the Southern Gas Corridor (SGC), the network of pipelines connecting Caspian resources to Europe. The opening up of the Southern Gas Corridor has got a strategic significance for Europe: it will provide Europe with a new route to secure a new source of natural gas supplies from the Caspian Sea, thus enhancing the energy security. Moreover, the SGC is designed to be expanded as soon as additional natural gas becomes available from complementary sources that will further increase competition on the European market to the benefit of consumers. The SGC opens a new and competitive route for Europe to import natural gas. In addition, the economic growth generating energy demand is rising, and a collective aspiration for EU membership, South East Europe, will also need a more environmentally balanced energy portfolio that includes natural gas. The SGC is envisioning as becoming a multi-source “superhighway” that would bring new source of natural gas to an increasingly import-dependent Europe. It will initially transport 10bcm/a of the natural gas from the Shah Deniz Phase 2 development and will condensate the giant field Shah Deniz in the Azerbaijani sector of the Caspian Sea to Europe. It will represent around 2% of the EU’s gas consumption. The SGC is a complex of multiple upstream and midstream projects: Shah Deniz 2 upstream in Azerbaijan, the South Caucasus Pipeline expansion (it is an expansion to increase the capacity of the existing pipeline SCP), the Trans-Anatolian Pipeline (TANAP) and the Trans-Adriatic Pipeline (TAP). The Trans-Adriatic Pipeline is the European leg of the Southern Gas Corridor. TAP will pave the way for new sources of energy to enter these markets and promote development of their energy sectors. TAP will be 878 kilometres in length (Greece 550 km; Albania 215 km; Adriatic Sea 105 km; Italy 8 km). 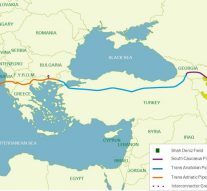 It will start near Kipoi on the border between Turkey and Greece, where it will connect with the Trans Anatolian Pipeline (TANAP). From there, TAP will continue onshore, crossing the entire territory of Northern Greece, its longest stretch, then onwards East to West from Albania to the Adriatic coast. The offshore section of the pipeline will begin near the Albanian city of Fier and it will traverse the Adriatic Sea, landing in San Foca, in the Melendugno Municipality. Then it will tie into Italy’s gas transportation network in Southern Italy through a TAP Interconnection, the SNAM pipeline project. TAP is a real project, which is currently under construction. It is on track to deliver first gas on time and on budget starting from 2020: considerable progress has been made in Albania, Greece and Italy. TAP is more than 50% complete. This includes all engineering, procurement and construction scope. In addition, 100% of pipelines have been delivered in the three Countries with more than 45% of welded steel pipe in the ground. Recognizing its crucial contribution to the strategic goal of enhancing Europe’s energy security and diversity, Europe and the TAP Host Countries strongly support the realization of the project. This is also linked to the fact that TAP will facilitate natural gas deliveries to Bulgaria and the Western Balkans through the Interconnector Greece-Bulgaria (IGB) and Ionic Adriatic Pipeline (IAP). TAP is also cooperating with the Albanian state for the domestic natural gas market development. TAP is a long and successful business story. After an international pipeline competition, in late June 2013, TAP was selected by the Shah Deniz field development consortium as the Southern Gas Corridor’s European leg and the final investment decision (FID) (incl. gas sales agreements with European buyers in September 2013) on Shah Deniz Phase 2 upstream venture was taken by the consortium in mid-December 2013. Intergovernmental Agreement and Host Government agreements strengthen the support of the National governments (Italy, Albania and Greece) for the TAP Project. TAP has six highly committed and experienced shareholders (BP – 20%, SOCAR – 20%, Snam – 20%, Fluxys – 19%, Enagas – 16% and Axpo – 5%), with a very robust track record in delivering and managing pipelines. Snam, the most recent shareholder to join the project (December 2015) continues to enhance TAP’s strategic position as a truly European project and reinforces TAP’s successful joint-venture model which brings producers, leading infrastructure players and gas buyers together. TAP brings several benefits to Greece, Albania and Italy. These include the creation of direct and indirect jobs. Currently more than 5,500 people are working for the project in Greece, Albania and Italy, with these numbers expected to increase as the project progresses through construction. This also includes numerous sub-contractor companies, which provide various goods and services to TAP. The project will directly contribute to the three countries’ Gross Domestic Product (GDP) through millions of Euro in taxes. TAP has also rehabilitated 58 kilometres of access roads and bridges in Albania, which is also a benefit for 200,000 people. ■ enable improving skills and abilities through support for education and training initiatives. Each of TAP’s host countries have different development priorities. For example, in Italy, TAP and Snam are jointly investing in the local territory with specific project proposals. The investments are focused on: Decarbonisation, energy efficiency; local content and SEI projects. In addition, Snam has committed to invest in the development of certain industrial projects that focus on decarbonisation (LNG, SSLNG, bio methane etc.) following the results of feasibility studies and the granting of the necessary local authorizations. Gas corridors play a crucial contribution to the strategic goal of enhancing Europe’s energy security and diversity and they may play a political role in an area that is so crucial for the European stability.